Learn to live a more grateful life in just 90 days. #1 New York Times best-selling author Rachel Cruze guides you on a 90-day journey toward contentment—one where you actually love your life and not someone else’s. • The first 30 days focus on gratitude—where you’ll recognize the blessings in your life. • The next 30 days focus on humility—where you’ll think of others more and of yourself a little less. • The last 30 days focus on contentment—where you’ll be happy for others and not want what they have. Study after study backs up that your relationships, health, decision-making skills, kindness and even sleep can get better with gratitude. The Contentment Journal will help you grow and change in ways you can’t yet imagine. Through personal stories and daily writing prompts, Rachel will guide you day by day, week by week to feeling more thankful. Motivational quotes and reflection pages will encourage you to keep going! If you give Rachel 5–10 minutes a day for 90 days, she’ll help you adjust your whole outlook so you avoid the comparisons and experience lasting contentment. 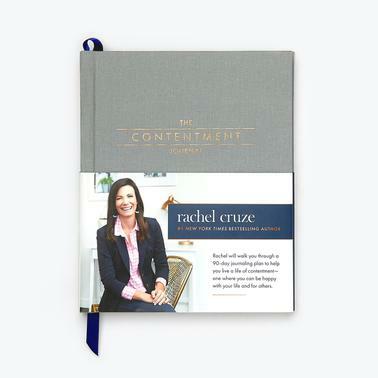 Get a FREE preview of The Contentment Journal! Target Audience: People who want to cultivate gratitude and contentment in their life.